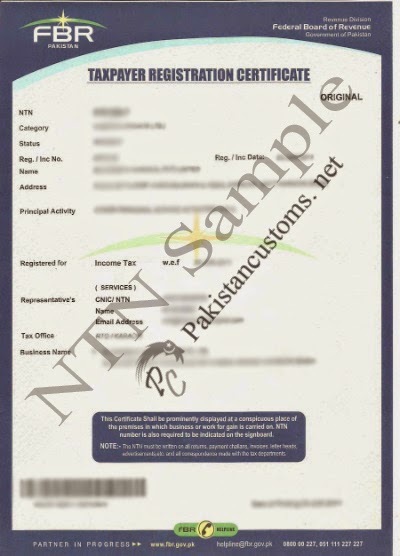 National Tax number is an identification document of the people who are registered with Federal board of revenue (FBR) government of Pakistan. NTN Stands for the national tax number. It is a tax identity for people and organizations who gain more than Rs. 400 thousand every month. In Pakistan, all nationals who hold a credit card, an auto or own a business must get an NTN certificate for the Income Tax office. Here Taxpayer Registration means, obtaining National Tax Number (NTN) from the FederalBoard of Revenue for making taxable transactions. National Tax Number (NTN) can be obtained for Income Tax, Sales Tax, and Federal Excise purposes. This NTN can also be used for Import and Export of goods. 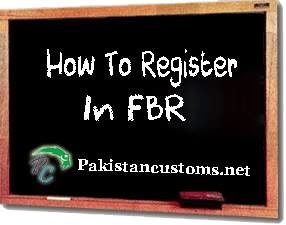 3- For registration of all the above type of persons, there is a single form notified by FBR which can be downloaded by Download Taxpayer Registration Form. This form can be used for registration of new taxpayers as well as making changes in particulars. It is the responsibility of each registered taxpayer to notify the changes in his particulars such as address, contact number, e-mail, the name of employer, bank account number, etc. Step 2: An online form based on the taxpayer type (Individual, AOP, Company) selected in step-2 above will appear on next screen. Complete all the particulars appearing on the form. You may save the form with available information and resume at altering stage if so required. Step 4: After successful verification, Submit the form by Clicking “Submit” button. The system will assign a Token Number which should be noted for checking the status of eth application either online or by calling at 24-Hrs help line at 051-111-772-772. Once the taxpayer registration application is approved, the system will send an e-mail to the taxpayer. The NTN Certificate can be obtained by visiting any of Taxpayer Facilitation Centers and submitting a duly signed copy of the online application along with required documents. In order to avail various electronic services (e-Services) offered by FBR such as Changing the Registration Particulars, e-Filing of Returns (Sales Tax and Income Tax), e-Filing of Withholding tax Statements, e-Payments, etc. ; you may apply for e-Enrollment apply for e-Enrollment online from here and user id, password and PIN.